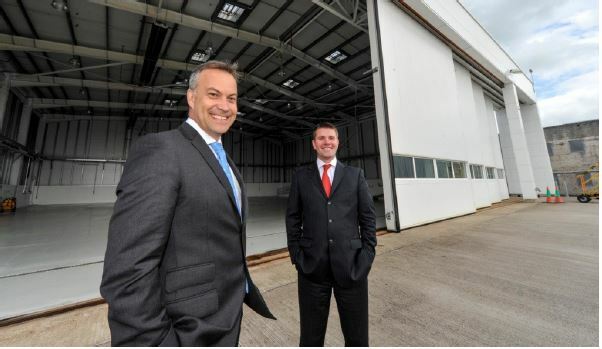 (L-R, Nick Weston, Managing Director, Weston Aviation and Cliver Power, Head of Finance and Commercial, Cork Airport outside the new Weston Aviation hangar and Business Aviation Centre. Weston Aviation has signed a long term contract to open a new Business Aviation Centre and FBO at Cork International, Ireland. 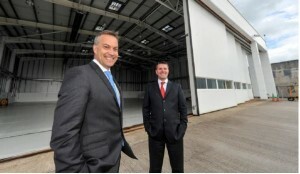 The Business Aviation Centre at Cork Airport is Weston Aviation’s first venture outside the UK as the company takes up residence at the executive hangar and office facility at the airport. This will be the first time that executive aircraft can avail of a hangar service at Cork Airport through Weston Aviation’s own hangar facility. Already operating at four UK airports, Weston Aviation offers fixed based operations (FBO) and cargo handling as well as aircraft fuel and support services. The opening of the Business Aviation Centre marks the company’s move to expand internationally and the new facility will be open for business during September. Weston Aviation will offer its full range of services including FBO services, long term and adhoc hangarage and concierge services. He added:”We were also drawn to Cork Airport because of the size and structure of the airport as it is similar to that our our other airport partners, where we continuously reinvest to develop our business and have seen year on year growth and development”. Welcoming Weston Aviation, Clive Power, Head of Finance and Commercial at Cork Airport said:”We are delighted to welcome a company of the high calibre of Weston Aviation here at the airport. It is a positive sign for the local economy that a company such as Weston Aviation sees the potential in the region. It is also an endorsement of our fist-class activities a the airport.